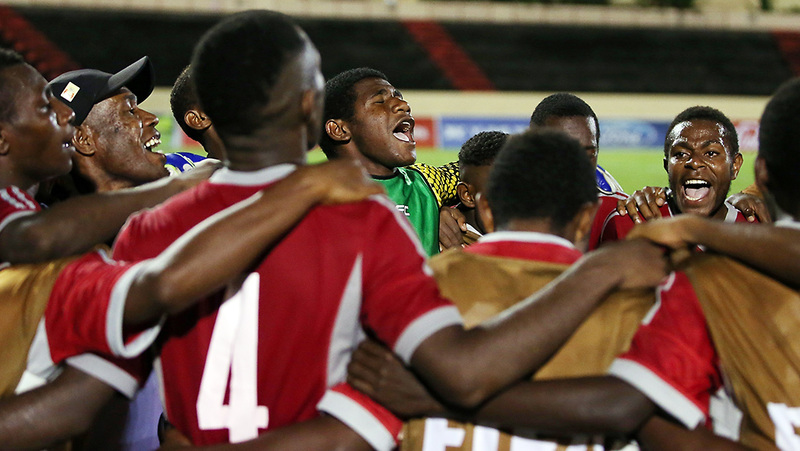 Papua New Guinea have qualified for the OFC U-17 Championship semi-finals for the first time in the nation’s history after a 2-1 victory over Tahiti dashed the hosts hopes of a dream qualification on home soil. The Melanesians join New Caledonia who progress in the top spot after beating Vanuatu 3-2 in the day’s earlier match at Stade Pater. Harrison Kamake, Papua New Guinea’s coach, was almost completely lost for words following the final whistle. It wasn’t an easy task for Kamake’s side as they took on not only a much-favoured Tahitian side, but also their boisterous home crowd. Tahiti seemed to have the match under control from the outset and it took just ten minutes for them to open the scoring courtesy of an unmarked Eddy Kaspard who latched onto a long ball and finished with aplomb. Their opponents had a couple of advances into the Tahitian half during the first period, but little that really troubled goalkeeper Moana Pito. However, in the second half the Melanesians seemed more determined in their chase of an historic result. The first sign that things were on the up for Papua New Guinea came with the equaliser in the 71st minute when Jonathan Allen neatly placed the ball past a Pito. Barthy Kerobin forced a fantastic save from Pito, who was impressive between the sticks, in the 87th minute, but the corner that followed had the captain and his backline beaten. Emmanuel Simongi leaped high to connect with the delivery and headed home a winner that sent the Papua New Guinea bench into raptures. Despite their best efforts Tahiti couldn’t pull themselves back in line. Tahiti have finished second in four of the last five U-17 tournaments so to lose out on home soil was a major disappointment from Patrice Flaccadori’s perspective. “Every time we’ve competed we’ve made the finals and this time, not even the semis so it’s a huge disappointment for us. “In the first half I thought we were in good stead. We found our rhythm in terms of our control of the ball,” he said. Kamake said his side’s mentality is what drove their success this evening. “We had the fighting spirit towards the back end of the game,” he said.